Recorded at Théâtre du Châtelet, Paris, France on May 21 & 22, 2013. Cover photo by Frédéric Netter. 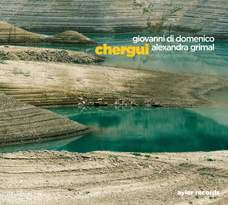 Alexandra Grimal goes in her own way, elegant but robust, through the territories of jazz and improvised music over recent years. It was only natural she would meet and regularly play in duet settings with Giovanni di Domenico, as versatile an adventurer as Alexandra is, both in his musical choices and collaborations. Three years after their first recording together (2011's Ghibli on the Sans Bruit label), Chergui was recorded over two nights at the Théâtre du Châtelet (Paris, France) and showcases solos and duets, either based on Giovanni's compositions or improvised on the spot to catch the emotion of the moment.